The Live Art Development Agency (LADA) is a world leader in creating the conditions for artists and organisations in the national and international cultural sector to flourish. This project brought LADA together with QMUL to work on LADA’s core resource, the Study Room (SR) – an open access archive of over 6,000 items used by artists, students, academics, arts professionals and the public. The project utilised a variety of research methods to assess and enhance the SR holdings pertaining to Live Art and feminism. A programme of performance-based research strategies were designed to increase the visibility of specialised areas of cultural practice and investigate ways to redefine how these can be more widely disseminated. Drawing from both LADAʼs history of working with ʻundocumentedʼ areas of culture and Lois Weaverʼs practice-based research investigating the use of performance as a means of facilitating public engagement, the activities helped identify and develop thematic areas in the SR archive. A number of innovative events were held that allowed for the exploration and discussion of the the archive and the project’s themes including a socktail seminar and Wikipedia Edit-a-thon, out of which developed an article, “Editing Ourselves into History: A Live Art and Feminism Wikipedia Edit-a-thon” in the journal Contemporary Theatre Review. 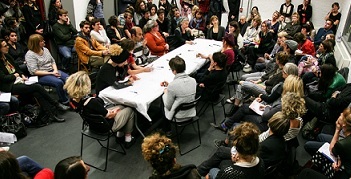 This includes a transcribed dialogue between Alex Eisenberg (LADAʼs Digital Manager) and Eleanor Roberts ʻOn the Web as a Tool for Power.ʼ A key focus of the project were two Long Tables – experimental public forums that included provocations for dialogues with artists, academics and the public. Documentation from from all events has been made available to researchers through the SR archive itself. The project also explored different approaches to the dissemination of this research including experimenting with archive inventories and increasing the archive. Strategies around curating and organising the SR content have been implemented by LADA, an ‘Are We There Yet’ – a new free multi-layered and multi-voiced guide on Live Art and Feminism – was produced as an online resource (with a small number of printed copies). The guide features a conversation between Lois Weaver and LADAʼs Lois Keidan about the project and their own personal histories of feminism and performance; a critical overview of the research by Eleanor Roberts; a series of maps created by artists reflecting their own experiences and influences in feminist performance; a ʻHow We Did Itʼ section by Lois Weaver on her approach to this project; and extensive lists of resources with catalogue references on materials on feminist performance housed in the LADA Study Room.